1575At midnight, the dogs, cats, and rats rule Venice. The Ponte di Ghetto Nuovo, the bridge which leads to the ghetto, trembles under the weight of sacks of rotting vegetables, rancid fat, and vermin. Shapeless matter, perhaps animal, floats to the surface of Rio di San Girolamo and hovers on its greasy waters. Through the mist rising from the canal the cries and grunts of foraging pigs echo. Seeping refuse on the streets renders the pavement slick and the walking treacherous. It was on such a night that the men came for Hannah. She heard their voices, parted the curtains, and tried to peer down into the campo below. Without the charcoal brazier heating her room, thick ice had encrusted the inside of the window and obscured her view. Warming two coins on her tongue, grimacing from the bitter metallic taste, she pressed them to the glass with her thumbs until they melted a pair of eyeholes through which she could stare. Two figures, three storeys below, argued with Vicente, whose job it was to lock the gates of the Ghetto Nuovo at sunset and unlock them at sunrise. For a scudo, he guided men to Hannah’s dwelling. This time, Vicente seemed to be arguing with the two men, shaking his head, emphasizing his words by waving about a pine torch, which cast flickering light on their faces. Men often called for her late at night¾it was the nature of her profession¾but these men were out of place in the ghetto in a way she could not put into words. Stealing a look through the protection of the eyeholes, she saw that one was tall, barrel-chested, and wore a cloak trimmed with fur. The other was shorter, stouter, and dressed in breeches of a silk far too thin for the chill of the night air. The lace on the tall man’s cuff fluttered like a preening dove as hegestured toward her building. Even through the window, she could hear him pronounce her name in the back of his throat, the “h” in Hannah like “ch” in the back of his throat sounding like an Ashkenazi Jew. His voice ricocheted off the narrow, knife-shaped ghetto buildings that surrounded the campo. But something was wrong. It took her a moment to realize what was odd about the two strangers. They wore black hats. All Jews, by order of the Council of Ten, were obliged to wear the scarlet berete, to symbolize Christ’s blood shed by the Jews. These Christians had no right to be in the ghetto at midnight, no reason to seek her services. But maybe she was too quick to judge. Perhaps they sought her for a different purpose altogether.Possibly they brought news of her husband. Perhaps, may God be listening, they had come to tell her that Isaac lived and was on his way home to her. Months ago when the Rabbi had told her of Isaac’s capture, she was standing in the same spot where these men stood now, near the wellhead, drawing water for washing laundry. She had fainted then, the oak bucket dropped from her arms onto her foot. Water soaked the front of her dress and cascaded over her shoes, wetting the paving stones. Her friend, Rebekkah, standing next to her under the shade of the pomegranate tree, had caught Hannah by the arm before she struck her head on the wellhead. Such had been her grief that not until several days later did she realize her foot was broken. The men moved closer. They stood beneath her window, shivering in the winter cold. In Hannah’s loghetto, dampness stained the walls and ceiling grey-brown. Her nightdress and the coverlet that she had snatched from the bed and wrapped around her shoulders to keep out the chill of the night clung to her, holding her in a soggy embrace. She hiked it higher around her, the material heavy with her nightmares, traces of Isaac’s scent, and oil from the skins of oranges. He had been fond of eating oranges in bed, feeding her sections as they chatted. She had not washed the blanket since Isaac had departed for the Levant to trade spices. One night he would return, steal into their bed, wrap his arms around her, and again call her his little bird. Until then, she would keep to her side of the bed, waiting. She slipped on her loose-fitting cioppà with the economical movements of a woman accustomed to getting ready in haste, replaced the coverlet over her bed, and smoothed it as though Isaac still slumbered beneath. While she waited for the thud of footsteps and the blows on the door, she lit the charcoal brazier, her fingers so awkward with cold and nervousness that she had difficulty striking the flint against the tinder box. The fire smouldered, then flared and burned, warming the room, until she could no longer see clouds of her breath in the still air. From the other side of the wall, she heard the gentle snoring of her neighbours and their four children. Peering through the eyeholes, now melting from the heat of her body, she stared. The tall man, his voice strident, pivoted on his heel and strode toward her building; the stout man trotted behind, managing two steps for each one of the tall man’s. She held her breath and willed Vicente to tell them what they wanted of her was impossible. To soothe herself, she stroked her stomach, hating the flatness of it, feeling the delicate jab of her pelvic bones through her nightdress. She felt slightly nauseous and for a joyful moment experienced a flicker of hope, almost like the quickening of a child. But it was the smell of the chamber pot and the mildew of the walls playing havoc with her stomach, not pregnancy. She was experiencing her courses now, and would purify herself next week in the mikvah, the ritual bath that would remove all traces of blood. Soon she felt vibrations on the rickety stairs and heard voices approaching her door. Hannah wrapped her arms around herself, straining to hear the mumbled voices. They called her name as they pounded on the door, which made her want to dive into bed, pull the covers over her head, and lie rigid. From the other side of the wall, her neighbour who had delivered twins last year and needed her rest, rapped on the wall for quiet. Hannah twisted her black hair into a knot at the back of her head, secured it with a hairpin. Before they could burst through the entrance, she flung open the door, about to shout to Vicente for assistance. But her hand flew to her mouth stifling a cry of surprise. Between the two Christian men, pale as a scrap of parchment, stood the Rabbi. Hannah backed into her room. Rabbi Ibraiham kissed his fingers and reached up to touch the mezzuzah, the tiny box containing Scripture fastened to the right-hand side of her door jamb. “Shalom Aleichem and forgive us, Hannah, for disturbing you.” The Rabbi had dressed in haste; the fringe of his prayer shawl dangled unevenly around his knees, his yarmulke askew. “Aleichem shalom,” she replied. She started to put a hand on the Rabbi’s arm but stopped herself just in time. A woman was not to touch a man outside of her family, even when not having her monthly flow. The Rabbi was stooped, his clothes redolent with the fusty odour of a man lacking a healthy wife to air them and insure he did not sit hunched all night reading over beeswax candles. Perhaps, Hannah thought, Rivkah had finally gone to the Jewish quarter in Rome to live with their oldest son as she had often threatened. The Rabbi’s marital troubles were not a secret from anyone in the ghetto within earshot of their apartment. He and Rivkah had not enjoyed a peaceful moment in their forty years together. Our help? Hannah thought. Did she deliver sermons? Did the Rabbi deliver babies? “But, as I have explained to the Conte,” said the Rabbi, “what he asks is not possible. You are not permitted to assist Christian women in childbirth.” Only last Sunday in the Piazza San Marco, Fra Bartolome, the Dominican priest, had railed against Christians receiving medical treatment from Jews or, as he phrased it, ‘from enemies of the cross’. This time it seemed the Rabbi was on Hannah’s side. They had common cause in refusing the Conte’s request. The Conte looked to be in his fifties, at least twice Hannah’s age. Fatigue hollowed cheeks, making him appear as old as the Rabbi. His brother, perhaps ten years younger, was soft and not as well made, with sloping shoulders and a narrow chest. The Conte nodded at her and pushed past the Rabbi into the room, ducking his head to avoid scraping it on the slanted ceiling. He was large, in the fashion of Christians, and florid from eating roasted meats. Hannah tried to slow her breathing. There seemed to be not enough air in the room for all of them. “I am honoured to meet you,” he said, removing his black hat. His voice was deep and pleasant, and he spoke the sibilant Veneziano dialect of the city. Jacopo, his brother, was immaculate, his chubby cheeks well powdered, not a spot of mud disgracing his breeches. He entered warily, placing one foot ahead of the other as though he expected the creaky floor to give way under him. He made a half bow to Hannah. The Conte unfastened his cloak and glanced around her loghetto, taking in the trestle bed, the stained walls, the pine table and the menorah. The stub of a beeswax candle in the corner guttered, casting shadows around the small room. Clearly, he had never been inside such a modest dwelling and, judging by his stiff posture and the way he held himself away from the walls, he was not comfortable being in one now. “What brings you here tonight?” Hannah asked although she knew full well. The Rabbi should not have led the men to her home. He should have persuaded them to leave. There was nothing she could do for them. “My wife is in travail,” said the Conte. He stood, shifting his weight from one leg to the other. His mouth was drawn, his lips compressed into a thin white line. The brother, Jacopo, hooked a foot around a stool and scraped it over the floor toward him. He flicked his handkerchief over the surface and then sat, balancing one buttock in the air. The Conte’s eyes were blue, cross-hatched with a network of fine lines, but his shoulders were square and his back erect. How different he appeared from the familiar men of the ghetto, pale and stooped-shouldered from bending over their second-hand clothing, their gemstones, and their Torah. His was the face of a man suffering for his wife’s pain; Hannah felt a stab of compassion. Difficult confinements were familiar to her. The hours of pain. The child that presented shoulder first. The child born dead. The mother dying of milk fever. “It is the natural course of events,” the Rabbi said. “Does not the Book of Genesis say, ‘In pain are we brought forth’?” He turned to Hannah, “I have already told him you would refuse, but he insisted on hearing it from your own lips.” He opened his mouth to say more but the Conte motioned for him to be silent. To Hannah’s surprise, the Rabbi obeyed. But he was right. 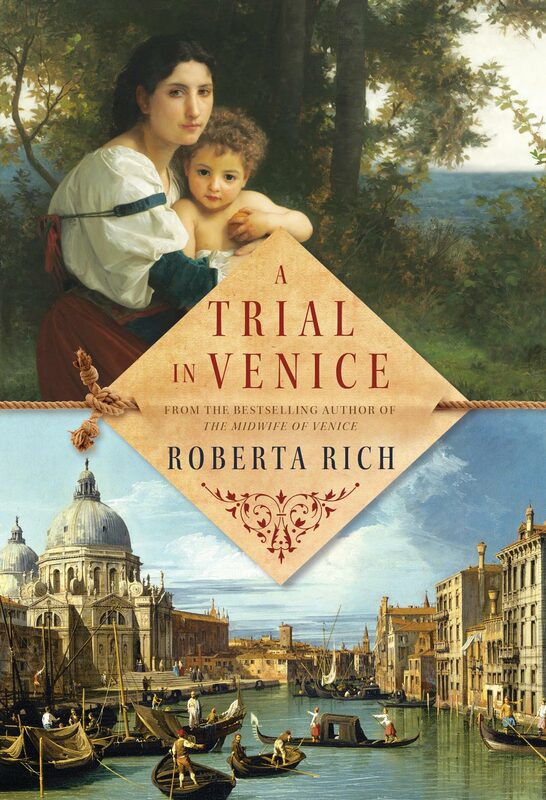 There was no other levatrice in Venice who was as gifted as she. The babies emerged quickly and the mothers recovered more speedily when Hannah attended their accouchements. Only the Rabbi understood the reason, and he could be trusted to keep silent, knowing that if anyone discovered her secret she would be branded as a witch and subjected to torture. Hannah’s eyes were level with the buttons of his cloak. As he spoke, he swayed from fatigue. She took a step back, afraid he would topple on her. Embarrassed and shocked, she pulled her hands away. Hannah regretted it too. If only she had kept her creation a secret. Hannah tried to swallow but her throat was too dry. The Conte had ventured into the canals at night, courted disaster from roving bands of ruffians, bribed Vicente to unlock the gates, and roused the Rabbi from his bed. Few husbands would take such trouble. She glanced at the Rabbi, whose black eyes, wiry eyebrows winging up toward his bald head, fixed her with a scowl. He was blocking the door, standing in front of her with the air of a man who would not step aside for God himself. When Hannah’s sister, Jessica, converted to Christianity, the Rabbi had, in accordance with Jewish law, ordered the family to sit shiva, the traditional mourning ritual for the dead, and to never utter her name again. “Jessica, may her name be obliterated and the teeth rot in her head,” he had said as Hannah wept and her father covered the family’s only looking glass. The Rabbi had forbidden anyone in the ghetto from having contact with Jessica from that moment on. Her sister lived only a few canals away. Hurrying to the Rialto market at dawn, Hannah had often crossed paths with Jessica as she made her way home from a party or fancy dress ball, attired in a gown of rich silk, sequins and a masque. Each time, obedient to the Rabbi’s injunction, Hannah would duck her head and take another route. A year later, a midwife’s apprentice arrived at the gates of the ghetto out of breath from running to summon Hannah to Jessica’s confinement. The Rabbi forbid Hannah from accompanying the apprentice and chased her away. If he heard the Rabbi, the Conte gave no sign, shrugging off his cloak and laying it on the only space available, the bed. A look crossed his face and for a moment Hannah thought he would wrap her up in his cloak, sling her over his shoulder, and carry her out into the night. “You must try,” he replied. Hannah should have been accustomed to such remarks¾she heard them often enough, but she whirled on him, ready to say the first thing that came into her head, which was to curse him as the whore son of a pig. Instead, she cleared her throat and addressed his brother. Jacopo let out a snort of laughter. Hannah kept her eyes fixed on the Conte, who was not laughing. His eyebrows knit together as he pondered the demand. It was a shocking sum. Two hundred ducats were sufficient to buy a hundred bolts of printed silk, a cargo of timber, or Isaac’s life. No one, not even a nobleman, would pay such an amount for her services. A few silver coins were her usual fee. This would end the discussion and send the Conte back to his palazzo. The Rabbi was right. If Hannah failed to save the Contessa, the Inquisition would force her to submit to the strapado. Her hands would be bound behind her back and she would be dropped from a great height. “Time is running out,” Hannah said. These were the hands that had blessed her many times, had circumcised her brothers, and had held the silver kiddush cup to her lips at Seder dinners. “Rabbi, I did not stand under the wedding canopy with three thousand Jews. I stood under the huppah with one man¾Isaac.” Her husband, she wanted to add, who had married her without a dowry, and had continued to love her in spite of her barrenness. In the synagogue, she had overheard the Rabbi assuring Isaac that the law would release him from a childless marriage. The Rabbi had urged him to divorce her and find a wife who would bear him a son. Isaac had pulled his prayer shawl more tightly around his shoulders and shaken his head. Most husbands would not have shown such patience¾for is not a child the takhlit, the purpose of all women? And how had she repaid this husband who, when her back was aching from bending for hours over the trestle bed of a labouring woman, would take the bahnaches glasses from the cupboard, heat them over a candle and apply them to her back? In the week before Isaac sailed, she had hurled at him an arsenal of wounding words¾said that if he loved her he would not sail to the Levant in search of wealth and prosperity, that he thought only of himself and was deserting her. The words he flung back were like knives. He told her she was a timid little ghetto mouse, afraid of taking a chance, that he was risking his life for her, for a better life for both of them. Then there was silence between them. They did not look at each other and slept far apart in bed. She had refused to see him off in his ship, La Dogaressa. The thought of him alone in Malta, believing she no longer loved him, was more than she could bear. If the Conte would pay, she would go with him. The Rabbi could be as angry as he wanted. “Will you pay what I ask?” she said to the Conte. “I will pay this outlandish sum. You can sail to Malta and ransom your husband before they work him to death in the stone quarries.” He picked up his cloak. Hannah had no time to be astonished by his agreement. She draped a scarf over her hair and slipped on her thin leather sandals as Jacopo and the Rabbi watched. The Rabbi was silent but his frail old body was rigid with fury. “Take me to your wife,” Hannah said to the Conte. She hurriedly gathered her equipment—an apron, an iron knife, clean gauze, vials, swaddling cloths, packets of medicinal herbs, and a silver amulet, a shadai, inscribed with the Star of David, meant to be hung over the cradles of newborns. May it not be too late; may it be needed tonight. She placed her supplies in a bag made of unbleached linen. But before she pulled the drawstring closed, she raised the lid of her cassone, patterned in bright marquetry, reached in, and quickly took out a long and narrow object wrapped in cloth. A corner of the material fell away and the light of the candle caught the sheen of her birthing spoons, two silver ladles hinged together. Her face, drawn and white, reflected in the bowl of one of the spoons. Before the men noticed, she tucked them into the bottom of her bag under the swaddling cloths. Her birthing spoons could save babies, but they could also maim. At a recent confinement, she had exerted too much pressure and had crushed the skull of the baby instead of easing it out. The mother was left with a tiny blue corpse to cradle in her arms. If Hannah made the same blunder tonight, she would be denounced as a slayer of newborns. The stairs creaked as he descended and the door at the entrance way slammed. Hannah wondered at Jacopo risking his life on the streets alone at night. Roving gangs of ruffians were commonplace¾a well-dressed man risked being robbed of his clothes and then shoved off a bridge into the fetid waters of the canal¾but she said nothing. “Come, we can be at ca’ di Padovani in a few moments. My gondola is moored on Rio di San Girolamo,” the Conte said. The Rabbi then stepped aside for her and the Conte to pass through the door. She sagged under the weight of the fur-trimmed wool. Clutching to her breast the linen bag containing her birthing spoons, she marched toward the gondolier in the wake of the Conte. The Rabbi followed closely behind. She could not help remembering the incident that had occurred last Purim at a house on the Calle del Forno. The midwife attending the birth had been unable to turn the foetus into proper position. To save the mother’s life, the midwife had used a crochet to pierce the baby’s skull and then had used a silken cord to rip the arms and legs from the child’s body in order to extract it. Tiny limbs were strewn about the Contessa’s bed chamber, tossed there by the midwife in her panic. Hannah prayed the same spectacle would not greet her tonight.